Delta Force has been making a splash around the world for the past few years, first opening a centre in Ireland, then expanding further afield to Australia and now onto the green pastures of New Zealand. Since our introduction into the UK paintball scene more than 20 years ago, we’ve been at the forefront of the paintball industry, introducing millions of customers to the exciting and adventurous sport of paintball. This global expansion has meant that we are now the world’s largest operator of paintball games, bringing the ultimate paintball day to people all around the globe. Our latest centre is located just on the outskirts of Auckland, New Zealand, in Woodhill Forest. Known as an adventure enthusiast’s playground, this location was the perfect setting for our flagship New Zealand paintball centre. Gone are the days of playing behind trees, hay bales and wooden pallets. 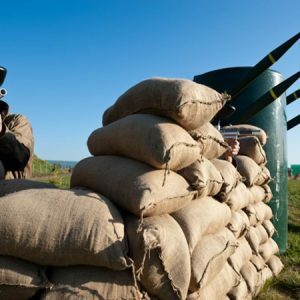 Our incredible game zones enable Delta Force customers to play on the very best themed scenarios in the world. The lush forest is ideal for paintball, enabling our customers to use the natural setting to sneak up on the opposition. Add this to our world-class movie-set props and you are in for a treat. With multiple ways to attack and defend each game zone, you’ll need to use all of your wit to come out of it victorious. 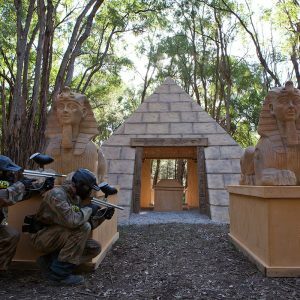 On a full day of paintball adventure at Delta Force Woodhill Forest you can expect to encounter a massive pyramid with stone sphinxes, a POW camp, coffins and crypts and a chemical alley that will have you trembling with fear. It really is the ultimate paintball experience. Attention to detail, great customer service and impeccable safety standards are what you can look forward to on your day out with the world leader in paintball games. We have listened to what our customers want and have provided New Zealanders with the perfect paintball venue. Come and visit us in Auckland to see what all of the hype is about. 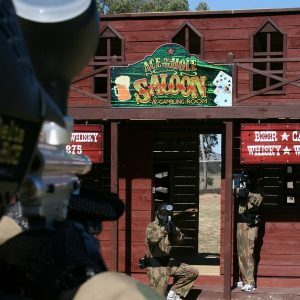 Whether it’s a birthday party, corporate event or just a group of mates getting together for one big shoot-out, you can rest assured that a day with Delta Force will be one to remember. If you have an occasion you want to celebrate in style then book up a day of paintball with Delta Force by calling our booking office on 1300 850 744.